Nowadays, businesses invest much more in design. They do so not only to build beautiful and functional products. They also do it to improve the way in which they create and deliver value for their customers. This requires an innovation culture and process led through design. Why is design good for business? What does the innovation by design process look like in practice? Almost 20 years ago, the Danish Design Centre developed the Design Ladder. This model illustrates the different ways in which companies use design. They based the Design Ladder on a hypothesis that has seen confirmation time and time again since. Higher revenue and a greater emphasis on design methods in the early stages of development correlate positively and give design a more strategic position in the company’s overall business strategy. Design forms a latent part of the teams responsible for product development and the task not handled by trained designers. The team members’ ideas about good function and aesthetics usually decide the outcome, while users’ perspective plays little or no role in the process. Many designers use the term “styling” for this process. Professional designers may carry out the task but typically people with other professional backgrounds handle it. Design does not mean the final appearance but a process integrated from an early stage of its development. Both economic viability and users’ needs and pains drive the solution. This setup requires the involvement and collaboration of product managers, product owners, business analysts, developers, marketing experts, researchers and of course, designers etc. The design professionals work with the company’s owners/management to rethink the business model. They focus on the design process in relation to the company’s business strategy and its desired future position on the market. Why is design good for businesses? A higher placement on the Design Ladder correlates with a positive effect on earnings. Companies that systematically incorporate design into their processes have higher chances of success on the market when introducing new products or services since design provides contextual insights and helps define innovation opportunities and strategies. 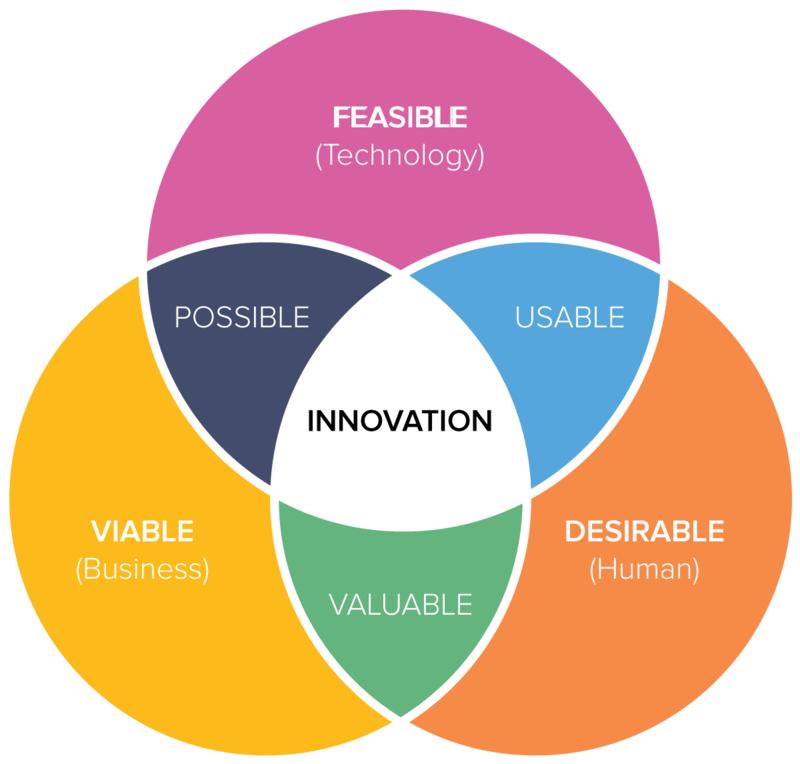 The diagram suggests that these three elements must come together to create successful innovation design. But how does this convergence happen? Not just by chance. Design represents a great idea – identified as a driving force – that aligns technology with customers’ needs and business goals. We can manage business innovation, structure it into processes, and use it to stimulate the creative potential within the organisation. However, it makes the process unpredictable. Besides, it takes time. 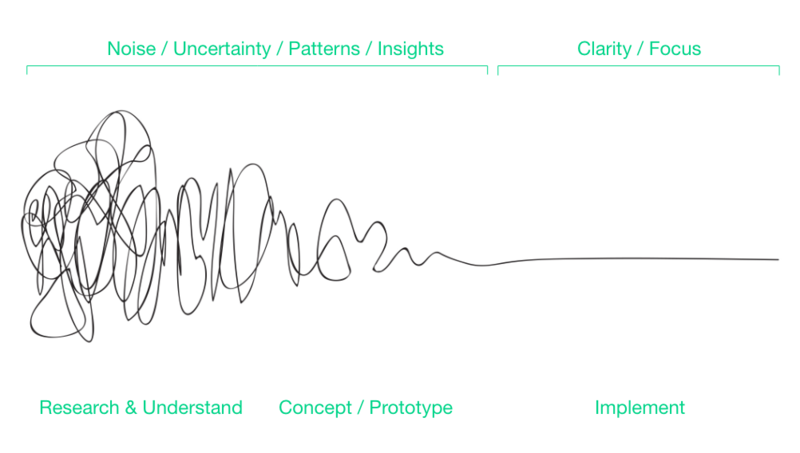 Damien Newman created the Design Squiggle, which visually represents the characteristics of the Design Process. But don’t get discouraged. The result will likely provide a powerful new business model that will assure your company’s future growth. 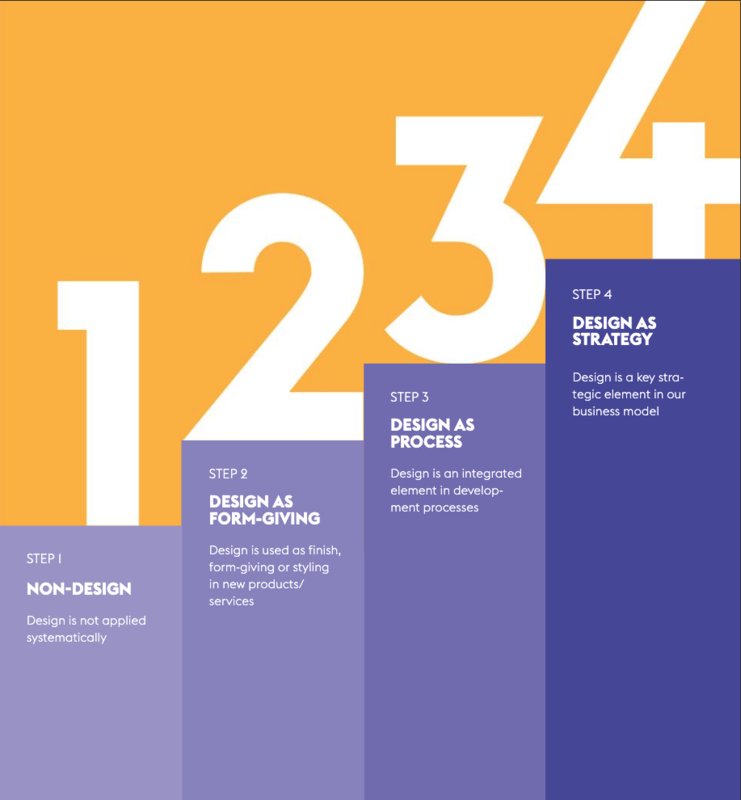 We put together a step-by-step guide to help you understand how design-driven business innovation can take place. In this guide we will focus on customer-driven innovations. Knowing your customer’s needs will help you adjust your value proposition, rethink your product or service, and ultimately build your whole business model around them. In this step, strive to discuss the company situation with its stakeholders to discover different the current state and perspectives. Whatever the case, start by understanding the challenges the organisation faces. We at UX studio recommend doing it in a workshop together with other team members, as they will likely have different understandings. Find useful information on how to fill in the BMC – as well as many useful tools – at Strategyzer. After creating the BMC, understand the environment in which the business operates. 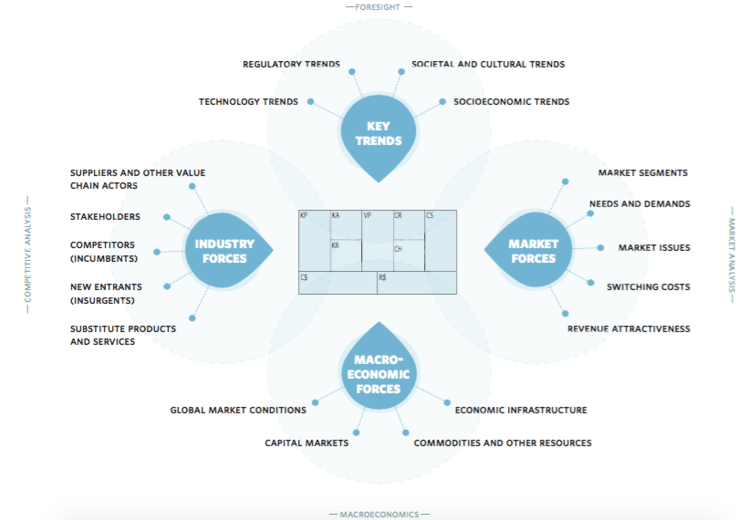 Zoom out and take a look at the business environment, identify your competitors, then talk about trends, macroeconomic and market forces. You will need to address them and ideally turn them to your advantage. In this step, consider collecting and analysing competitors within the relevant context the most important activity. After the third step, go deeper. Identify all your (potential) customer segments by filling in the BMC. Now choose your main customer segment and focus on it. To help yourself with this process, start by creating a persona. It will give your customer segment a personality which you can empathise more easily. Personas make customer’s characteristics more tangible and concrete. Next create an assumptive customer journey. Again, assumptive means you likely haven’t done any research yet. 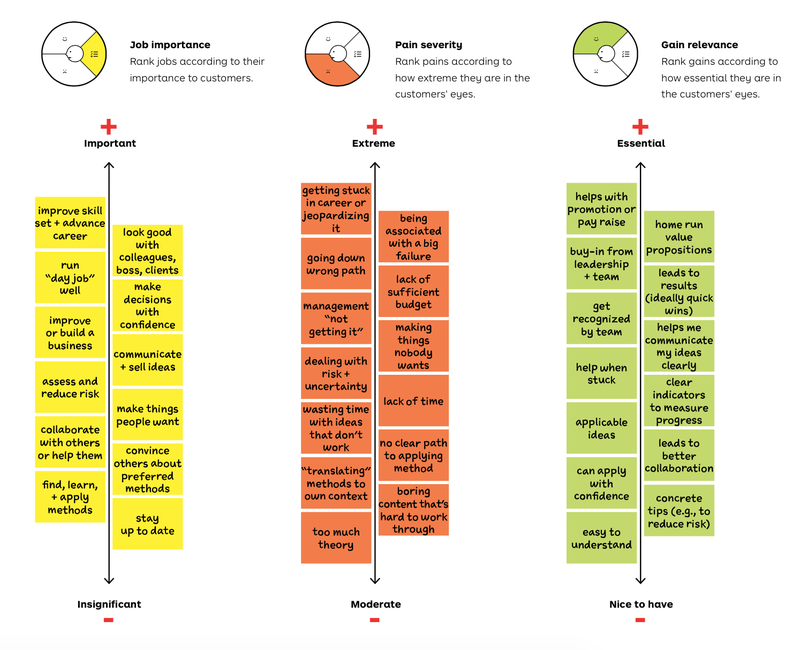 Mapping the user journey will provide you and your team with insights into how customers experience your product or service, as well as how you might better serve or even delight them. At this point, you could easily fall into the trap of believing you know your customers very well and you don’t need to do field research. You would be making a terrible mistake. Don’t. Combining field observation with interviews gets the best insights. For anyone unsure about how to plan, conduct and analyse interviews, we wrote this guide. You might find it useful. What jobs does our customer try to do in their work or life? What pains does our customer face before, during, and after, or even completely prevents them from doing so? What gains does our customer face after getting a job done? 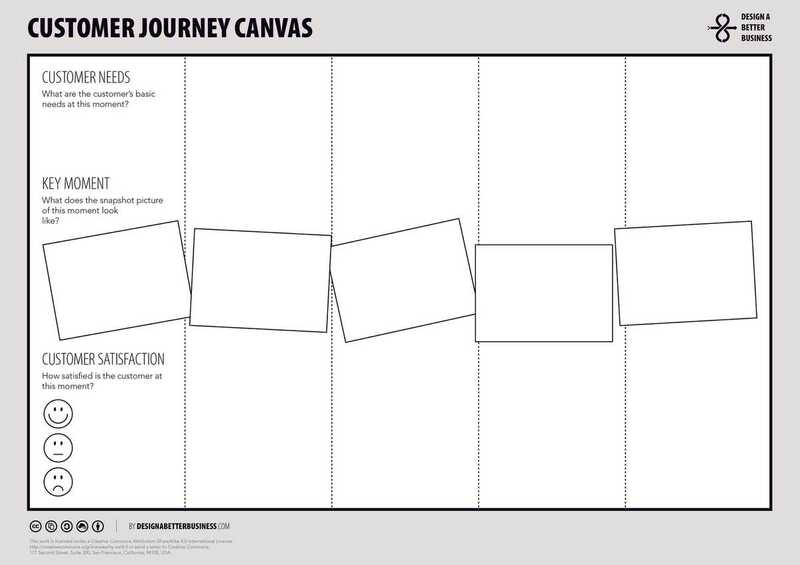 To organise the insights you will get from the interview, use the Value Proposition Canvas. It makes you think differently about your customers and what you offer them. On the right, we have a customer profile. It helps clarify your understanding of the main customer segment. On the left, we have the Value Map. This helps describe how you intend to create value for that customer. Essential gains on top and nice-to-have gains at the bottom. For the next step, identify the value you wish to create for your main customers: your value proposition. An outstanding value proposition should focus on the most important jobs, pains and gains of your customer. 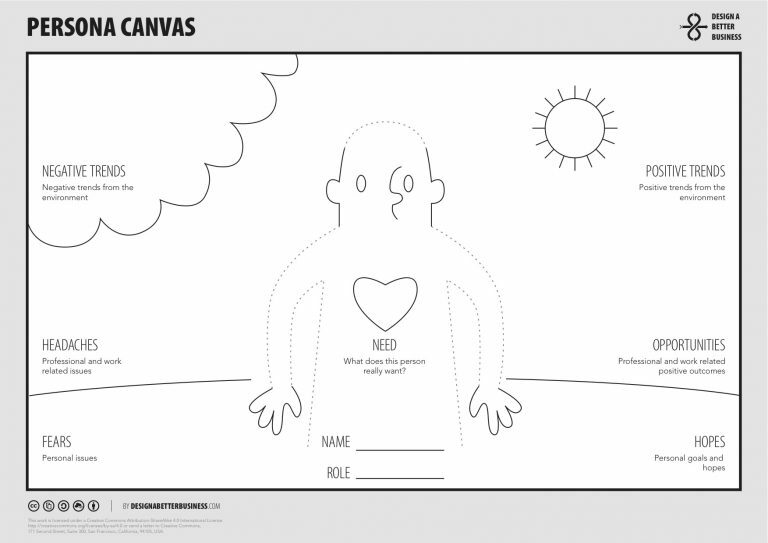 The left side of the Value Proposition Canvas comes into play here. It will help you make explicit how (you believe) your products and services will help customers get jobs done, ease pains and create gains. What products and services do (can) we provide to enable our customers get their most important jobs done? How do (could) our products and services help customers alleviate their most extreme pains? How do (could) our products and services create expected or desired outcomes and benefits for our customers? 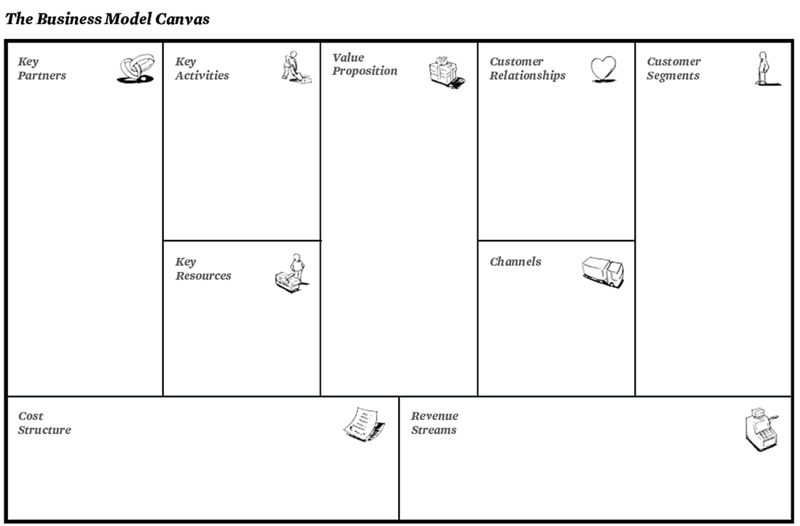 Find a fit between the Customer Profile and Value Map canvasses. When you do, your value proposition will excite the customers. This will only happen when you address important jobs, alleviate extreme pains and create essential gains that they care about. Even though we don’t have a clearly defined value proposition yet, we do have the basic building blocks. 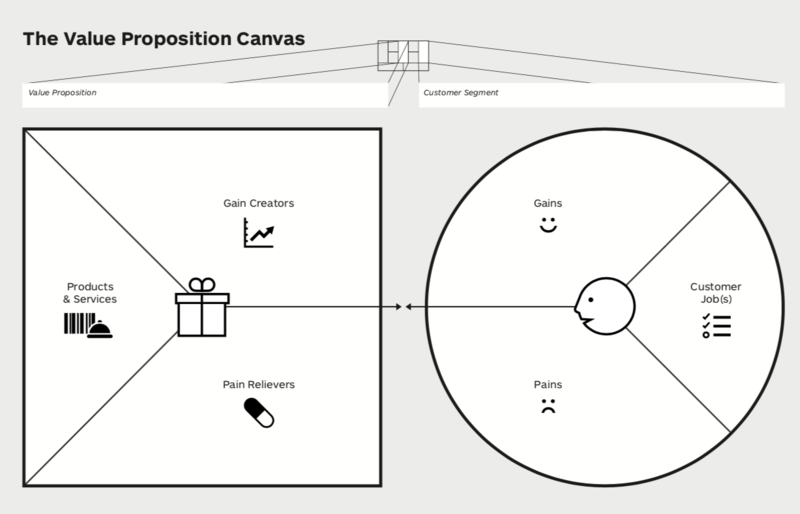 We can use the top ideas from our Value Proposition canvas to quickly sketch multiple value propositions, using the Ad-Lib below. Don’t settle for just one – try to explore multiple directions. Next translate the new value propositions into the form of products, features, services, processes, brand experiences etc. Brainstorm with your team to figure out what possible solutions you could deliver to your customers. But don’t stop there, try to describe what features a product will have, what structure a service will have etc. In the case of digital products, look for features which will directly address your customer’s pains and help them carry out their jobs. After the brainstorm session, you should have a multitude of solutions and ideas which will require prioritisation. To get an idea on how to do it, check our article on feature prioritisation techniques. It explains the process in more details. Again, do the feature prioritisation in a workshop together with the other team members. Next build a prototype to bring your ideas to life. Prototyping means making quick and rough models of your ideas to explore alternatives. Of the many prototyping techniques, start with some quick hand-drawn paper sketches. They will allow you to quickly explore radically different directions for the same idea before refining one in particular. Then go digital by building wireframes and interactive prototypes, ranging from low to high fidelity. Read more on prototyping techniques here. Last but not least, test your solutions with real customers from your potential target group. Conducting interviews and user tests will indicate if the customers would use the solution you have in mind. They will also provide you a lot of valuable insights into how to improve it. The customer willingness to try the product or service. For testing the product, check out our Ultimate Guide To Successful Usability Testing. Based on the user feedback and analytics you collect, start making improvements to your business model. You might realise that customers find your value proposition hard to understand, or the product or service inconvenient to use. Whatever the issue, the process doesn’t end here. Market size – The number of potential customers and value of the market. It will give you insights about the sales potential of your product or service. Competition – Gauge market competition, determine the market position of various competitors and plan strategies to tackle them when the time comes. Customer segmentation – Determine the size of your main (potential) target group and if it has clear segments with different drivers of demand, price sensitivity etc. These quantitative market insights will help determine the intensity of the need which your product or service addresses, the size of your potential target group, how much they would pay for your solution, how the threat of your competitors, etc. #1 Prepare for the future by constantly reflecting on the current business model and discovering ways to improve it. #2 Understand your current or potential customers. Find out what they want to achieve the most and what causes them the biggest pains which your business might address. #3 Adjust / Adapt your value proposition to address the most important needs of your main customers. #4 Ideate for solutions which directly address the jobs your customers are trying to accomplish or alleviate the pains that are giving them headaches. #5 Prototype the low-hanging-fruit solutions in particular and test them with real customers. Iterate based on the feedback you get. Find our more about the UX process! Download our free ebook Product Manager’s Guide To UX Design to improve user experience in your product. Here is an actual printed comprehensive guide on designing digital products people will love – Product Design book. And we ship it worldwide! More into in-person learning? Reach out to us if you are thinking about organising an in-house UX training for your team. We definitely have some ideas! Next articleWho Should You Hire, and Why? Product design- how to find the proper tool, and not to lose yourself in the trends.